The state will not be hiring any new employees in 2015 in a bid to reduce recurrent expenditure, Finance Minister Abdulla Jihad told parliament’s public accounts committee last night (October 22). Jihad told MPs that government ministries and various state institutions have proposed creating more than 5,000 posts next year. However, President Abdulla Yameen has decided to “freeze employment” during 2015, Jihad revealed. All state institutions should consider reducing expenditure as domestic debt has reached MVR16 billion (US$1 billion), he added. Jihad noted that the government’s economic council was currently reviewing the estimated annual state budget for 2015 ahead of submission to the People’s Majlis for approval. President Yameen’s campaign pledge to create 94,000 new jobs would be fulfilled through spurring job creation in the private sector, he added. 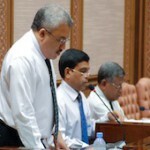 In August, Jihad warned that the ballooning fiscal deficit could affect the government’s ability to pay civil servants. Jihad explained that shortfalls in revenue of MVR1.5 billion would see the deficit increase to MVR4 billion – equal to 10.6 percent of GDP. The government currently employs just under 25,000 civil servants, representing over seven percent of the population.